Elvis Presley, the "King of Rock 'n' Roll," was the leading American singer for two decades and the most popular singer of the entire early rock 'n' roll era. Elvis Aron Presley was born in Tupelo, Mississippi, on January 8, 1935, to Gladys and Vernon Presley. His twin brother, Jesse Garon Presley, died shortly after birth. His father worked as a carpenter, farmer, and factory worker to support the family but was not successful in any of his jobs. Raised in a poor and religious environment, Elvis grew especially close to his mother. Elvis's singing ability was discovered when he was an elementary school student in Tupelo, and he first started singing with the choir of his local church. He received his first guitar as a birthday present when he was about twelve and taught himself how to play, although he could not read music. He went on to participate in numerous talent contests in Tupelo and in Memphis, Tennessee, where the family moved when Elvis was thirteen. cut his own records. Less than a year later he recorded "That's All Right Mama" for Sun Records. It became his first commercial release, selling twenty thousand copies. Elvis reached the top of the country charts with "Mystery Train" in 1955. His first number one song on the so-called "Hot 100" was "Heartbreak Hotel" (1956), which held that position for seven of the twenty-seven weeks it was on the chart. This song also reached the top of the country charts, and it became a symbol of his ability to combine country singing with rhythm-and-blues, as well as with the new rage that had grown out of rhythm-and-blues: rock 'n' roll. The rest of the 1950s brought Elvis "living legend" status with records that included "Hound Dog" (1956), "Don't Be Cruel" (1956), "Blue Suede Shoes" (1956), "Love Me Tender" (1956), "All Shook Up" (1957), and "Jailhouse Rock" (1957). He started the 1960s in similar fashion with "It's Now or Never" (1960) and "Are You Lonesome Tonight?" (1960). Elvis was universally dubbed the "King of Rock 'n' Roll" and led the new music from its beginnings in the 1950s to its peak in the 1960s and on to its permanent place in the music of the 1970s and the 1980s. His impact on American popular culture was tremendous, as he seemed to affect manner of dress, hairstyles, and even behavior. John Lennon (1940–1980) would later note Elvis as one of the most important influences on the Beatles. Even his spinning hip movements became legendary as he continued his rock 'n' roll conquest to the extent of 136 gold records (500,000 sold) and 10 platinum records (1 million sold). Ultimately he had the most records to make the rating charts and was the top recording artist for two straight decades, the 1950s and the 1960s. Elvis was an instant success in television and movies as well. Millions watched his television appearances on The Steve Allen Show, The Milton Berle Show, The Toast of the Town, and a controversial (open to dispute) appearance on the The Ed Sullivan Show, in which cameras were instructed to stay above the hips of "Elvis the Pelvis." He was an even bigger box office smash, beginning with Love Me Tender in 1956. Thirty-two movies later, Elvis had become the top box-office draw for two decades, with ticket sales over $150 million. Although few of Elvis's motion pictures were well-received by the critics, they showcased his music and extended his image and fame. His movies included Jailhouse Rock (1957), King Creole (1958), G. I. Blues (1960), Blue Hawaii (1961), Girls! Girls! Girls! (1962), Viva Las Vegas (1964), and Spinout (1966). Wild in the Country (1961), based on the J. R. Salamanca novel The Lost Country, marked his debut in a straight dramatic role. Elvis began a well-publicized stint in the army in 1958. That year, while he was stationed in Fort Hood, Texas, his mother died. The remainder of his military service was spent stationed in Germany, until his discharge (release) in 1960. It was in Germany that he met Priscilla Beaulieu (1945–), his future wife. Elvis's success in the entertainment industry was accompanied by numerous failures in his personal life. He arranged to have Priscilla, still a teenager, live at his new Memphis home, Graceland Mansion, while she finished high school there. He married her in 1967, and she bore him his only child, Lisa Marie Presley, in 1968. In 1973 he and Priscilla were divorced. During this time, and for his entire career, his personal manager, Tom Parker, controlled his finances. As Elvis's millions grew, so too did the mismanagement of Parker, a known gambler. Parker was later prosecuted for his financial dealings, but he was acquitted (proven innocent). Elvis made an estimated $4.3 billion in earnings during his lifetime, but he never acquired a concept of financial responsibility. This caused frequent legal battles during and after his lifetime among his management people and several record companies. Elvis had similar luck with his friendships, and frequently surrounded himself with a gang of thugs to shield him from an adoring public. A weight problem became evident in the late 1960s, and in private Elvis became increasingly dependent on drugs, particularly amphetamines and sedatives. His personal doctor, George Nichopoulos, would later be prosecuted, but acquitted, for prescribing and dispensing thousands of pills and narcotics (illegal drugs) to him. Though Elvis's weight and drug dependency were increasing, Elvis continued a steady flow of concert performances in sold-out arenas well into the 1970s. On August 16, 1977, the day before another concert tour was about to begin, Elvis was found dead in Graceland Mansion by his fiancée, Ginger Alden. The official cause of death was heart disease, although information revealed after his death about his drug dependency created a media event. His death caused worldwide scenes of mourning. 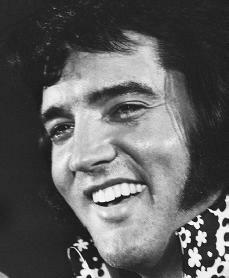 Elvis continues to be celebrated as superstar and legend as much in death as he was in life. Graceland Mansion, which he had purchased in 1957 for $102,500, is the top tourist attraction in Memphis and has attracted millions of visitors from both America and around the world. Presley became the first-ever inductee into three music halls of fame when it was announced that he would be inducted into the Gospel Music Hall of Fame on November 27, 2001, in Nashville, Tennessee. He was already a member of the Rock and Roll Hall of Fame and Country Hall of Fame. Gordon, Robert. The Elvis Treasures. New York: Villard, 2001. Jenkins, Mary. Memories Beyond Graceland Gates. Buena Park, CA: West Coast Publishers, 1989. Parish, James Robert. The Elvis Presley Scrapbook. New York: Ballantine Books, 1977. All articles on Elvis state that he started his army service in 1958. I am 76 years old and was stationed in Hanau Germany during 1956 and part of 1957. I recall when Elvis was shipping in to the sea port of Bremerhaven Germany while I was still in Germany in 1957. I remember it like it happened last week. I was only 23 years old and very impressed! Elvis was born January 8,1935 NOTAugust. So where did you get your info. Everyone knows when he was born. So I read that his wife's name used to be Priscilla Wagner, but on here, it says Priscilla Beaulieu. I don't know which to believe!! !